This weekend’s Full Moon is exact in Singapore on 9 July at 12:06 pm. This Full Moon joins shadowy Pluto in stern Capricorn, stationing itself directly opposite the Sun + aggressive Mars in emotional Cancer. Pluto entered Capricorn in 2008 and will stay here until 2024. Capricorn is associated with male power + authority, patriarchal systems, as well as leadership in governments, businesses and organisations; on a personal level, Capricorn is associated with our individual structures, the ways we organise our lives, and our relationships with men (mainly male authority figures). On the other hand, Pluto’s energies invoke our shadow sides, the dirty laundry that we keep secret and suppressed, and that (ironically) has more power over us, the more we deny it. Pluto entered Capricorn in 2008 and will stay here until 2024. As you may have noticed, Pluto’s stay in Capricorn so far has been marked by major scandal worldwide, exposés of the abuse of power in the highest places, and revelations of very ugly behaviour in the people and leadership systems that many of us have placed our trust in. We as a global community have been shocked and saddened by many of the developments that Pluto in Capricorn has overseen, but these revelations are necessary in order for us to take action, learn from our mistakes, and grow as one human race. Keep it low-key this weekend, folks. Power struggles can bring out the best – as well as the worst – in every soul. This could be a weekend where some people in your life are going to show their true colours, and you may be surprised at what you find. Work off those irritable, restless Mars-in-Cancer energies! Go back to nature, get some fresh air, work up a sweat. Exercise, particularly in or near water (Cancer is a Cardinal Water sign), will do wonders for your inner equilibrium and stave off any crabbiness (haha, see what I did there). Be mindful whom you spend the weekend with. Keep the HELL away from difficult and toxic people. If you don’t have a choice in the matter (i.e. the person in question is someone you live with), maintain a discreet distance and walk away from any attempt at starting a fight. Watch out for road rage, give dangerous drivers a wide berth, and try not to scream at the idiot who’s blocking your way on the bus or train. With Mercury in Leo right now, transportation might get a little aggressive. 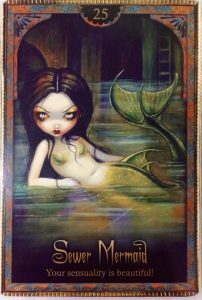 The Sewer Mermaid’s message: be unapologetically you – even the parts that you think belong in the sewer. Society, with its systems of power, has placed us into so many boxes in an attempt to control our identities and manipulate our lives. But if you’re tired of pretending to be someone else in order to please other people, this message is for you. make choices that are true to yourself. Because you’re the only one you can truly please in this lifetime.